The Agnes O’Kane Award will be presented annually to a volunteer who has contributed to the growth of youth orchestras in Ireland. The award recognises the vital contribution that volunteers have had in the growth of youth orchestras over the last thirty years. Nominations for the 2020 award will open in late 2019. To nominate a person for the award, please send a description of their activities in the area of youth orchestras, outlining why you think their work has been exceptional. Nominations should be two or three A4 pages and can be submitted by post or email (info@iayo.ie). The Agnes O’Kane Award for 2019 was received by Donegal Youth Orchestra’s Mary Armitage. Mary Armitage has been the heart at the centre of the Donegal Youth Orchestra for the past 20 years. Her unsparing commitment, reflected in her attendance at every rehearsal and concert, is extraordinary. So is her role in the development of music in Donegal. She has been involved from the beginning in the development efforts which brought about, firstly, the Donegal School of Music, and then the Donegal Music Education Partnership, more than a decade ago. The Agnes O’Kane Award for 2018 was presented to Carmel Garrett for her work with the Galway Youth Orchestras. Carmel, a founding member of IAYO, has been synonymous with Galway Youth Orchestras for over 30 years. Carmel initially volunteered when her own children started playing with the orchestra where her leadership and organisational qualities led her quickly to the role as chair. Selflessly, long after her children had left the orchestra, she continues on in this role overseeing the continuing rise and growth influencing the lives of 100’s of young people from the west of Ireland year on year. Click here to read more about Carmel’s work. The Agnes O’Kane Award for 2017 was presented to Pauline Rogers for her work with Mayo Youth Orchestra. In 1995 she was a founding member of the Mayo Concert Orchestra and later helped establish the MYO. She has a commitment to inclusion and accessibility and has worked hard to ensure that all musicians benefit both musically and socially from their involvement with the orchestra. Click here to read more about Pauline’s work. The Agnes O’Kane Award for 2016 was presented to Gina O’Leary (Shine) for her work of many years in developing the instrumental programme, orchestras and ensembles at St Canice’s National School in Kilkenny where Gina has promoted access to music for all children and fostered and developed musical talent in the school. Thanks to the efforts of Gina, generations of young people have had access to instrumental tuition and playing in ensembles with numerous students having progressed to careers in music. 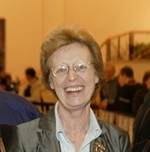 The 2015 Award was presented to Sister Concepta Murphy for her tireless efforts in promoting music in Donegal, setting up the County Donegal School of Music and the Donegal Youth Orchestra with a clear mission statement – to address the impoverishment of classical instrumental tuition in County Donegal. The success of her work is more evident today than ever with the school of music now flourishing as the Donegal Music Education Partnership and the orchestra a regular and impressive performer at the IAYO Festival in the National Concert Hall. The 2013 award was presented to John O’Brien, (pictured) for his voluntary work with Dublin Youth Orchestras and IAYO. John volunteered with the DYO for 29 years and undertook a number of the vital administrative tasks needed to maintain a youth orchestra. In recent years he was Webmaster, Chairman of the DYO Council, the DYO Board and Honorary Treasurer. He also chaired the IAYO Executive Committee for a number of years. In 2012, Joanna Crooks (pictured to the left) has been given the award for her work with Dublin Youth Orchestras, IAYO (of which she was the original Festival Manager), the National Youth Orchestra of Ireland, The European Federation of National Youth Orchestras, Jeunesses Musicales Ireland and, latterly, the St Agnes Violin Project and Orchestra. Read about Joanna’s work here. The 2011 Award was presented to Philip O’Kane for the support and work that the O’Kane family have put into IAYO throughout the years that Agnes was Administrator and Chairperson of the Association. Listen to the speeches by Vincent Hunt and Philip O’Kane on the presentation of the first award. ten years of making music in ireland: the story of IAYO’s first ten years told by Agnes. With the early death of Kathleen Agnes O’Kane née Murphy on 4 April 2010 the world of youth and music lost one of its tireless voluntary mothers. Agnes was a beacon in the struggle to make Ireland a better place for young people, guided by an open and wise intelligence, articulated with sensitivity in the written and spoken word. the European Association of Youth Orchestras (EAYO). Agnes was born on the first of October 1945, the eldest of six children. Her parents, Kathleen (née Riordan) and Timothy Murphy, and their parents, came from gaelic speaking West Cork and Kerry. She grew up in the centre of Cork City on Pope’s Quay in a terraced house between the Dominican Friary and Church of St Mary’s to the right, the Queen Anne House to the left and to the front, the old Atheneum or Cork Opera House on the opposite side of the North Channel of the River Lee. Agnes attended the Catholic primary and secondary girls schools in Gerald Griffin Street (1813) run by the Sisters of the Presentation (1775). With limited resources, they taught Agnes well. She won local and national prizes in her final year at school: a Cork Corporation Scholarship, a UCC College Exhibition, and a national award for an essay “Éire agus An Comhphobail Eorpach” (1962). At a time when a small fraction of each age cohort attended secondary school, and an even smaller fraction went up to University in Ireland, Agnes was the first pupil of the North Presentation Convent Schools to matriculate and attend a University (1962). Outside school, Agnes’ musical ear was stimulated by matinee performances in the Opera House and Savoy Cinema across the river, the Feis Maitiu, and by the liturgical music of The Cathedral of St. Mary and St. Anne (1808) and St. Mary’s Dominican Church (1832-39) next to her home. She studied music with the St Mary’s church organist, pianist, violinist and choirmaster, passing the eighth grade in pianoforte, playing the syllabus of the Trinity College of Music, London (1961). Agnes read English and French at University College Cork (1845) for an outstanding joint honours degree of the National University of Ireland, winning the French Government Gold Medal for French language and literature in her final examination (1965). She was awarded an MA in English Literature in 1967. Like many of her generation, in the autumn of 1967 Agnes sought employment in London. She taught briefly in Tottenham Comprehensive School, before moving to Creighton Comprehensive, a Labour Party education experiment. In the company of friends she enjoyed the musical riches of London. Agnes taught A- and S-level English literature in St. Bernard’s Catholic Grammar School in Slough, for two years from autumn 1968 to 1970. She returned to Ireland with her young family in the autumn of 1970, settling in the Dublin suburb of Dundrum. She taught evening classes in French to adults in the nearby Ballinteer Community School in the mid 1970s. An invitation in 1976 to help the nascent Irish Preschool Playgroups Association (IPPA) sparked Agnes’ interest as a young mother. IPPA sought to disseminate throughout Ireland best international practice in the provision of childcare and the running of playgroups. The same concerns recurred each year as the number of private playgroups in Ireland grew rapidly and government stood mostly to one side. IPPA promoted a code of standards for playgroups, suggested criteria for the qualifications of staff, and ran lecture courses on the needs of the young child. They also stressed the importance of parental contributions to education, the teaching equipment and materials, adequate insurance provision, first-aid training and childcare legislation. IPPA was a forerunner in coordinated national and international representation of these activities, particularly during the international year of the child in 1979. The annual Newsheet of 1977 names Agnes as the organiser of the inaugural monthly meetings in Area 6 (Dundrum, Rathfarnham, Churchtown) following the division of Dublin into six areas to ensure better engagement with the IPPA members, who were running playgroups. By 1978 Agnes was the honorary secretary of the C.E.C. – the central executive committee, and honorary general secretary. In 1979 she also chaired the sub-committee dealing with Community playgroups. Promoting the aims of the IPPA, she lectured and spoke publicly, visiting as many playgroups as she could. Agnes resigned from the IPPA committee in May 1979 to move with her family to Portugal for two years. Portugal reminded Agnes of the Ireland of her childhood. The Irish Dominican Sisters and Friars had been in Lisbon since the early seventeenth century. The Sisters ran Schools in Portuguese at Belém (O Colégio do Bom Sucesso), and in English at São Domingos de Rana (St Dominic’s International School) attended by Agnes’ three older children. Scoil Naithí began in the spring of 1973 with a public meeting in the hall below Holy Cross Church in Dundrum after An tAifreann Gaelach. The meeting elected a committee of parents who wanted an Irish-speaking primary school for the education of their children. The committee found a headmistress, invited her to take charge of the new school, provided her with prefab classrooms on a site beside St. Attracta’s Primary School in Ballinteer, and opened on 1 July 1973 as a Gaelscoil with two teachers and thirty one pupils. Agnes attended that first meeting, and her eldest child joined the school in the third cohort of pioneering pupils. A permanent school building was opened in 1980. The issue of 19 March 1982 of INNIU Nuachtán Náisiúnta na nGael described the success of the school during its first decade. The school’s board of management and its project-driven sub-committees of parents, including Agnes and her family, worked on a voluntary basis. The school choir under the direction of the headmistress was extraordinarily successful in national competitions such as Slógagh. The annual editions of the Irisleabhair Scoil Naithí, 1988-92, show Agnes as a member of the Board of Management elected by the parents. In Autumn 1986 Agnes was elected as one of two representatives of Scoil Naithí on the National Parents’ Council (Primary tier). She also acted as honorary secretary. Her involvement came to an end with her move to Cork in 1992. The Dublin County Orchestra for Young Players (DCOYP), later called the Dublin Youth Orchestras (DYO), also began spontaneously in Dundrum in the late 1970s with a group of parents, including Agnes, who met at Christmas-time with their children to make music. As the participants grew more numerous it soon became impossible to hold the event in a private house. The result was a move in February 1982 to a hall in Holy Child Community School in Sallynoggin, the formation of a youth orchestra with a professional conductor directing its musical development, and monthly rehearsals on a Sunday afternoon. A voluntary committee was formed, and charged with acquiring and distributing sheet music agreed with the conductor, attending to the hall, providing refreshments, collecting fees, organising public performances and exchanges with other orchestras at home and abroad. With ages ranging from 8 to 21 and strong demand, one youth orchestra soon became four. Simultaneously, committees begat sub-committees, always composed of voluntary parents, to handle the administration. Orchestral playing encourages players to listen to each other as they make music together. Playing chamber music is the most intense and intimate form of this experience. The Director of the Highnam Court (Gloucester) Summer School ran the 1984 inaugural summer string course for DCOYP in Aravon School, Bray. The following year Agnes took over as the honorary administrator of two residential summer courses of chamber music, which have flourished ever since. The Irish Association of Youth Orchestras, IAYO Ceolfhoirne na nÓg, began with a meeting in Maoin Cheoil an Chláir in Ennis in April 1994. Relying on DYO (DCOYP) support, Agnes was elected the founding Honorary Administrator and grew the association from her base in Cork. She was Chairwoman from 2001 to 2005, and Honorary Vice-President on her retirement from the board in 2005. IAYO was a member of the European Association of Youth Orchestras (EAYO) and Agnes served as honorary secretary on its Board. IAYO is a founder member of the Forum for Music in Ireland and of Jeunesses Musicales Ireland, supporting their efforts to promote and share all kinds of music for young people, at home and abroad. The annual IAYO Festival of Youth Orchestras in the National Concert Hall became the highlight of the year. Agnes wrote her book “Ten Years Making Music in Ireland” with its CD of Youth Music in Ireland for the 10th IAYO annual festival of youth orchestras held in the City Hall, Cork, in 2005, the year when Cork was European Capital of Culture. “A youth orchestra of 100 players represents at least 1,000 years of music lessons. The IAYO network of more than 60 youth orchestras covers the whole of Ireland. There are now more than 5,000 young instrumental players who come together to rehearse and play in orchestra every week. This has been an amazing journey of discovery. Ar dheis Dé go raibh a h-anam!